With Dropbox Camera Upload, you can automatically upload photos and videos from your smartphone or tablet, or from a camera connected to your desktop computer. Why would you want to do this? Granted, most people keep their digital photos and videos on their computers or backed up on discs and probably wouldn’t think of putting them on cloud storage — especially since they take up a lot of storage space. In fact, uploading a lot of photos and videos is a good way to use up your free Dropbox space pretty quickly. However, you may run into a situation in which Camera Upload would come in handy. An obvious situation is when you’re traveling and you’ve filled your smartphone with photos and videos. You need to free up some space in a hurry. With the Dropbox app on your phone, you can wirelessly transfer your photos and videos to Dropbox for safekeeping and delete them from your phone. Keep in mind, though, that it takes a lot of bandwidth to upload photos and videos, so you may also max out your data plan. It’s best to do this when connected to a wi-fi network. In the Dropbox app, go to Settings by either tapping the menu icon in Android and choosing Settings or, in iOS, tapping the Settings icons at the bottom of the screen. Tap Turn on Camera Upload. By default, How to Upload is set to Wi-Fi only, but if you want to enable upload at anytime, tap and choose Wi-Fi or Data Plan. By default, What to Upload is set to Photos and Videos, but if you want to upload only photos, tap and choose Photos Only. Now, whenever you take a new photo or video, the Dropbox app automatically uploads it to your Dropbox Camera Uploads folder until you turn the feature off. Dropbox remembers where it leaves off, so it won’t upload duplicates. 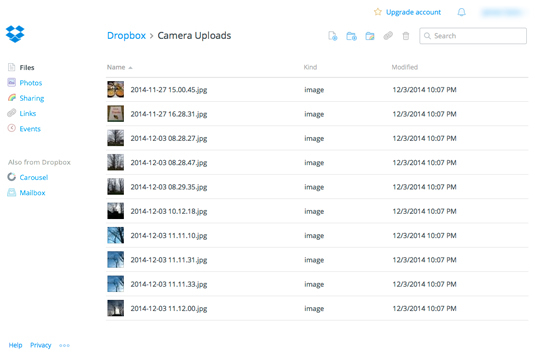 You can also enable Camera Uploads on your desktop computer through the Dropbox application. The process is very similar: You enable Camera Upload via the Preferences pane of the Dropbox application in the Mac OS menu bar or the Windows system tray. Then, whenever you plug a camera into your computer, your photos and videos automatically upload. You can access your Camera Uploads from your Web browser by logging in to your Dropbox, choosing Files, and opening the Camera Uploads folder. You see a list similar to Figure 1. Clicking a photo will load it in Dropbox’s preview screen. You can also click the Share button next to any photo to share it. Figure 1: Viewing Camera Uploads. 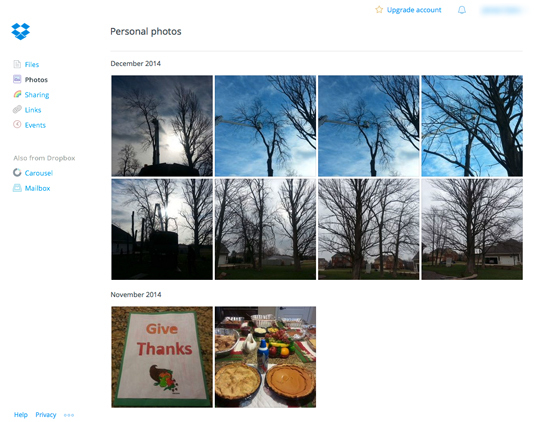 If you want to view your photos and videos grouped by month, click Photos in the left navigation in Dropbox. You see thumbnails of your photos and videos grouped by the month in which they were taken. Figure 2: Camera Uploads by month.